From page one it is evident that Funeral for a Dog is not your average summer read. Thomas Pletzinger has constructed a novel where the plot is a moving target. The characters jump from New York to Brazil, Germany to France. Events are recounted out-of-order, perceptions are presented as truths, the end of the book shows up at its beginning. Readers may initially find Funeral for a Dog difficult to understand. The opening 75 pages are a slog, filled with disorganized facts and data you’re not yet able to process. Keep going! As you continue to read the story coalesces and, suddenly, unexpectedly, Thomas Pletzinger has you. Putting this book down and walking away is no longer an option. Daniel Mandelkern, referred to simply as Mandelkern by almost everyone in the book, is a man in the midst of an identity crisis. An ethnologist turned journalist, he has been assigned a 3000 word article on the reclusive author of a popular children’s book. His boss is also his wife, and they are in the midst of an argument the day he leaves. She desperately wants them to have a child. He, too, is feeling desperate – for entirely different reasons. 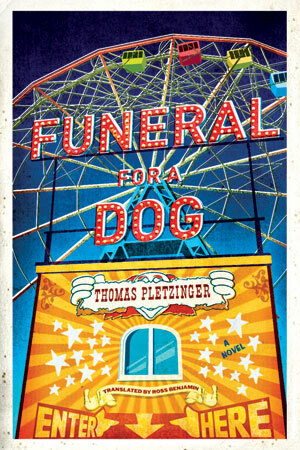 Mandelkern is the protagonist of Funeral for a Dog – but the story revolves around the author Dirk Svensson. From a folder of information compiled by an assistant we learn that Svensson lives with his three-legged dog, Lua, in a crumbling ruin of a house on a lake in Italy. He’s written a wildly popular children’s book dealing with death. It soon becomes apparent, to the reader and eventually to Mandelkern, that the research is incomplete. Mandelkern arrives for his interview accompanied by a woman and her young son. Svensson has been expecting all three. What follows is a puzzle. There is the mystery of Dirk Svensson and Lua. What is their relationship to the woman and her son? Who is Felix Blaumeiser – a man whose name keeps coming up but who no one wants to discuss? And how much of the manuscript of Svensson’s unpublished novel Astroland, which Mandelkern finds locked in a suitcase, is actually true? As Daniel Mandelkern digs deeper into the lives and losses of his host and fellow house guests, he also begins to examine his own. Loss is a major theme in Pletzinger’s novel, as are second chances. Despite what initially appears as depressing subject matter, the text of Funeral for a Dog is imbued with hope. The answers, when they are finally given, satisfy. So does the writing. Satisfy, I mean. Pletzinger’s style is stream of conscious for the segments inside Mandelkern’s head. It switches to something reminiscent of Jack Kerouac in the Astroland sections. The book even incorporates photographs of ephemera among the last few chapters (unnecessary, in my opinion, but inoffensive). Deductions are drawn, then refuted, then corrected. Somehow the story comes together – following its own strange logic . The fact that the narrator is an ethnologist is not a coincidence. Reading Funeral for a Dog is like discovering an file box filled with scraps of paper, old photographs, random junk… and then attempting to organize it into something usable/recognizable. The last page will leave you with a feeling of accomplishment – a sense of personal discovery. Funeral for a Dog is not an easy book. It warrants a second, careful reading; possibly even a third. But the extra effort pays out. Thomas Pletzinger has written a novel to be dissected, discussed and enjoyed. Even though you’re telling me the book is hard work, and the first 75 pages are the most painful, I have this incredible urge to read it. I want to experience victory over it! I love your review! I’m glad you feel that way! It is a challenging read, but so worth it. And when all the pieces fall into place – they do so perfectly. I couldn’t imagine a better ending than the one the author wrote.